Our analyses indicated that among the Yayoi people, most caries occurred in the root area, particularly on the approximal surface of the tooth root (Haraga, 2006). 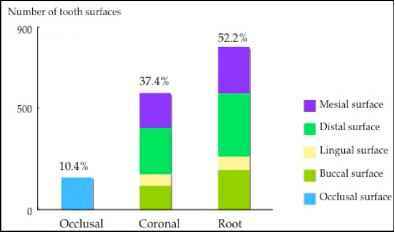 Moreover, Figure 3 shows the distribution of caries by tooth surface. 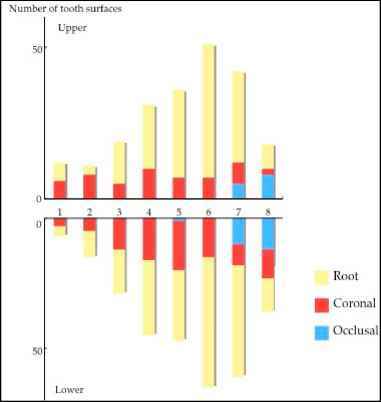 When categorized into 3 groups, namely occlusal, , the occlusal surface percentage was 10.4%, the crown and root were compared, the crown ratio was 37.4% and the root ratio was 52.2%. When Caries location was classified into 9 tooth surfaces as follows: occlusal surface, crown buccal surface, crown lingual surface, crown approximal surface, root buccal surface, root lingual surface, and root approximal surface. The caries frequency was highest in the root approximal surface area, followed in order by the crown approximal surface and root buccal surface, while it was lowest in the buccal and lingual surfaces of both the crown and root. Table 1. Number of teeth present, deciduous teeth, and teeth with caries, and rate and prevalence of caries. 6.9%, 26.9%, and 66.3%, respectively. Thus, most of the molar surfaces affected during the first caries attack were located in the root area. Therefore, these carious lesions may have been initiated in the root area in the Yayoi people. These observations indicate a different pathology from that seen in modern people. Thus, the mechanisms underlying the development of root and coronal caries in the people of the Yayoi period may be different from those in modern people. We have presented here the frequencies of carious lesions in younger and elderly people according to tooth type in Yayoi people (Fig. 5). 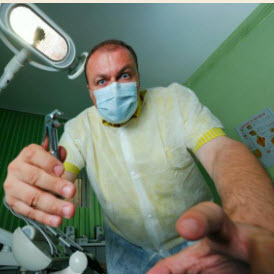 It is clear that the frequncy of carious lesions was higher in the elderly (Haraga, 2006). In the modern Japanese, the caries ratios in the first molars of younger and elderly people are very similar (Fig 6). These findings also support the suggestion that most of the caries was found in the root area in Yayoi people, likely following the establishment of periodontal disease. The location of dental caries in the people of the Yayoi period differs from that seen in modern Japanese people. In the skeletal remains of the Yayoi, most carious lesions were located in the root area, while in modern populations, most of these lesions are in the crown. This difference is considered to be associated with dietary variation, particularly the consumption of cariogenic foodstuffs. During the digestion of staple foods, such as rice, acid production causes tooth decalcification (Tayles et al., 2000). Moreover, cooked starch is more easily degraded and fermented by bacteria (Lingstrom et al., 1989). The Yayoi people engaged mainly in agriculture, in contrast to their forebears, the Jomon. Indeed, the Yayoi utilized an advanced system of wet-rice agriculture, which supported an increase in population density in western Japan during the Yayoi period. The increase in whole dental caries was associated to a great extent with the increase in root caries.